Over the past few years, its become a tradition of sorts to go and visit the trumpeter swans as they migrate to nearby areas for a few months. They are so beautiful. This year we went on a cool day and watched them for a bit. As we sat patiently and quietly, we heard their soft trumpeting. The moment was simply breathtaking. Although this visit was a couple of weeks ago, when I think back to that time, I can hear their soft trumpeting, feel the crisp air and be in the stillness of the moment. Simple moments can bring immeasurable joy. As the year end approaches many people write goals for the new year. Do you? If you are looking to make changes in your life, end of a year does provide a nice segueway to letting go of habits that no longer serve you. Some people create vision boards, with pictures of what they would like to do or have in the new year. Maybe it is a cruise, maybe peace of mind, perhaps a successful career, time with friends, or outdoor adventures. Pictures can be placed on a poster board and decorated. That vision board is then placed in a visible space so it can serve as a daily reminder. A way to stay focused, energized and motivated. Some people write their goals, put them in an envelope and seal it. Open it in 6 months and see where they are with their goals and if anything needs readjusting. Others might choose to read their goals daily for a month and put their goals away for a few months until its time to check progress. Some choose not to set goals, and carry on as before, making changes as needed. However you choose to move into the new year, I wish you love, happiness and peace. Some people look forward to the holiday season and others look forward to getting through the season quickly. Instead of joy, there is anxiety and sadness for some people. Maybe you are one of those who dreads this season, or you know someone who does. Pema Chodron a buddhist teacher, talks about “having an itch, but not scratching it”. In times of great discomfort there are ways to develop self love, kindness to self and others. How you relate to the present sows the seeds for how you will relate to the future. In no way does this reduce the experience you are having and the reason for the experience, but brings it to the forefront for healing. Plato used a phrase to explain what happens when something unpleasant happens. He explained it as “the fluttering of the soul”. The next step though after this emotional hit would be to stand back and determine what was going on. Based on that examination, making a decision that still aligns with ones values would have been this philosophers guidance. Cultivating compassion towards yourself and others is possible. Being present to feelings and doing things that proactively help you to get through the season is self nurturing. Find ways to take care of yourself that sustains you in a healthy way. Find a cause that you want to give to. Whether its your time or money find a way to share what aligns with your values even when you don’t feel like it. Take some breathing spaces through the holidays. By that I mean, step away from your thoughts and emotions. Check in with yourself by focusing on your breath. Simply observe your breath as you inhale and exhale. Stay with your breath. Let your breath be your anchor. Who knows from where the light came? One of the reasons I enjoy Autumn is because of the vibrant colors. 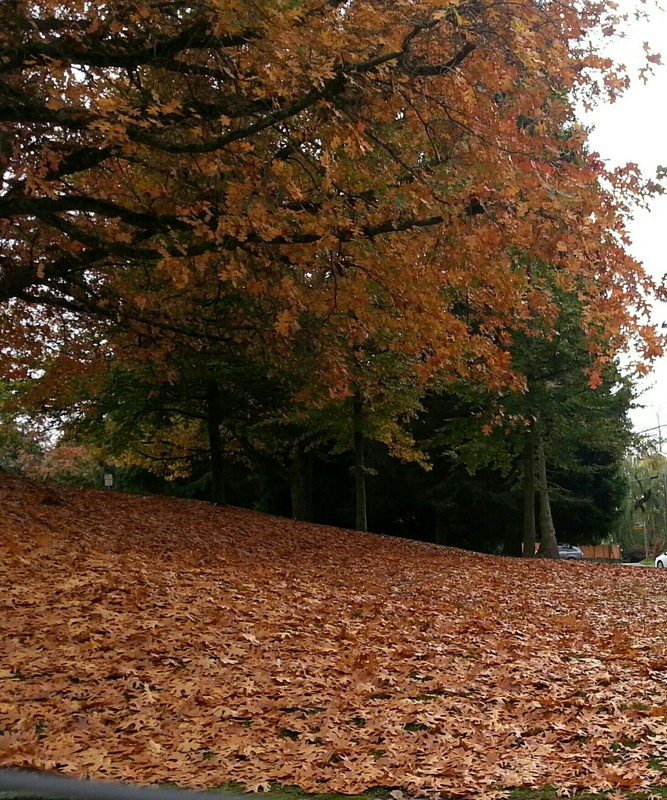 This carpet of gold leaves caught my breath today delivering instant joy.